I have recently gotten hold of a very wide monitor. Not quite wide enough for 2 editors, though, so I was thinking of having both the Project and the Structure sidebar open in parallel. Is it possible to have two open sidebars on one edge of the screen open in parallel, without them having share vertical space, but rather full-length along the edge, one closer to it than the other? 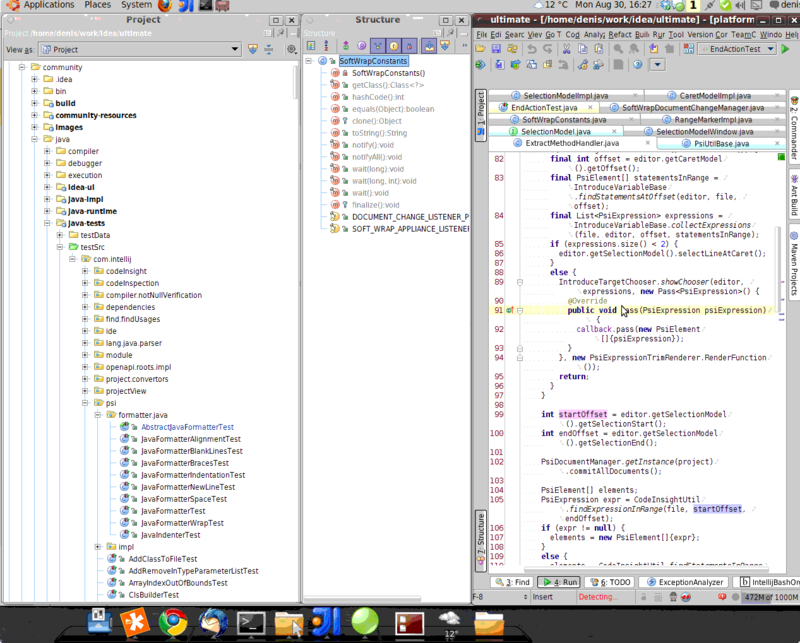 No, IntelliJ IDEA does not currently support this toolwindow configuration. Project and the Structure sidebar open in parallel. full-length along the edge, one closer to it than the other? Sure, you can make target panels ('Project' and 'Structure') floating, resize and locate them as necessary. Feel free to read more about that at the help. to achieve any layout that you need. Thank you for the amazingly quick replies! @Dmitry: Is such a feature planned? I think it would be pretty useful as everybody seems to be moving to widescreen configurations! Is it helpful to put an RFE in your JIRA? What's the reason for having the bars docked? You can resize the editor as well in order to avoid intersection in horizontal direction. Note that may screen is not wide enough to work conveniently with such a configuration. Actually, I have dual-monitors setup and all tool windows are located at the second screen. As I said, it's no must-have, but it would be really convenient. Well, the only suggestion is to submit a feature request then and convince the community to vote it up.